Get a free quote now for your new ventless fireplace from Early Times. Have you always wanted the warmth and coziness of a fireplace but your home doesn’t have a fireplace or chimney? Early Times has the solution for you – ventless fireplaces. A ventless fireplace is perfect for those who don’t have a chimney or that don’t want to deal with the maintenance. Ventless fireplaces have become increasingly popular because of their easy installation and low maintenance. You might be thinking, “are ventless fireplaces safe?” The answer is yes. Federal agencies and standard groups very strictly regulate fireplaces and they make sure that every ventless fireplace on the market is safe for your home. 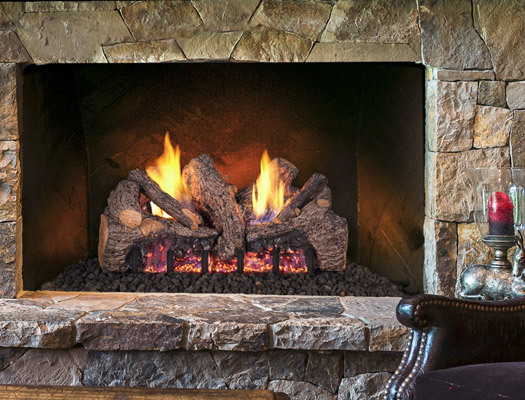 Early Times Home Solutions is Chicago’s ventless fireplace expert. We have many different styles and designs to fit your needs. Get a free quote now and join thousands of other happy homeowners who have trusted Early Times since 1985. Ventless fireplaces can be freestanding units or they can be installed in your existing fireplace without the need for costly repair work. Oftentimes, people have ventless gas fireplaces installed in their existing masonry or prefabricated fireplaces because they don’t want the work involved with a traditional fireplace but they still want to have the luxury of a burning fire. Ventless fireplaces are fueled by either natural gas or propane and need to be installed next to a gas line. How do Ventless Fireplaces Work? You might still be wondering how you can have an open fire burning in your home without the need of a flue and chimney. The answer is fairly simple. Since ventless fireplaces run on natural gas or propane, you can control the flame and the energy output in order to be as efficient as possible. The end result is a clean-burning flame that will keep you comfortable because you can lower the output if it gets too hot. Homeowners often install ventless fireplaces in their home for the aesthetic appeal. There are many different styles available that can range from traditional looking to modern and contemporary. There are some factors to consider when deciding to install a ventless fireplace in your home. The biggest factor to pay attention to is the size of fireplace you’re installing in the room. The fireplace must be an appropriate size in proportion to the room it’s going in. If the ventless fireplace is too big for the room, that can lead to unsafe carbon monoxide levels. However, when the correct size fireplace is installed by certified professionals, your ventless fireplace will be more than safe. They feature sensors that monitor the levels of carbon monoxide and oxygen to keep your home safe. Early Times is here to make sure your ventless fireplace installation is done correctly and that everything is up to code and follows all regulations. Also, ventless fireplaces can save you a lot of money. Overtime, clay tile chimney liners are no longer a safe option when burning wood. This means that in order to maintain safe burning, a stainless chimney liner and other costly repairs are a must. Ventless gas log units eliminate the need for these repairs because they’re exactly that, ventless. They can be installed into your existing fireplace at the fraction of the cost without the need for extensive and costly repair work. If you’ve always wanted the aesthetics and warmth of a fireplace in your home but don’t have, or want, a full chimney, then a ventless fireplace is your solution. They can be installed anywhere that a gas line can be put and offer you a more efficient option than a traditional masonry chimney and fireplace. There’s a wide variety of styles to choose from so you can create the best fireplace for your home. Early Times has been serving the Chicagoland area for over 30 years and takes pride in making sure your home is safe and looks great. Our experts will guide you throughout the entire process of installing a ventless fireplace to ensure your project is done properly and that you’re satisfied with the result.